Who doesn't love pesto, that rich, green highly aromatic sauce known for its decisive yet delicate flavor? Fresh pesto is one of those foods that epitomizes Italian cuisine - a blending of 6 high quality ingredients that when made fresh can make the most simple things taste divine. Village on the Cinque Terra from the hiking path. I can't eat pesto without thinking of its famous home in Italy, the Ligurian coast. A small and breathtakingly gorgeous region, Liguria sits on the Mediterranean Sea in Northwest Italy. The location along the pristine coastline, its back set up against the steep hills of the Appennini Mountains, give it a unique microclimate and landscape that produces the majority of the ingredients used to make their traditional pesto—Genovese basil, Ligurian extra virgin olive oil and even pine nuts from the Stone Pines that grow in abundance. And it's bordering region, Emilia Romagna, provide the essential Parmigiano Reggiano cheese. Ligurians use only the young tender leaves for their pesto. Ligurians are very proud of their pesto and fiercely defend their traditional recipe, Pesto alla Genovese. This is a D.O.P. protected food that has to be made in a precise way and with very specific ingredients. The primary ingredient being D.O.P. basil from Genoa, for example, because the soil and climate in that particular area gives the basil a flavor that’s impossible to replicate anywhere else in the world. The are also very specific about they use pesto, never randomly adding it to chicken or fish as we often do. Pesto is used for 2 things, pasta and soup. But again, not just any soup but specifically minestrone alla Genovese, a staple of daily life on the Ligurian coast. In terms of pasta there's a bit more variety here as gnocchi, a local version of Lasagna and a few traditional dried and fresh pastas, are acceptable. And of course the perfect pairing comes in a the form of a local wine made from Pigato (of the same DNA as Vermentino, Rolle and Favorita). 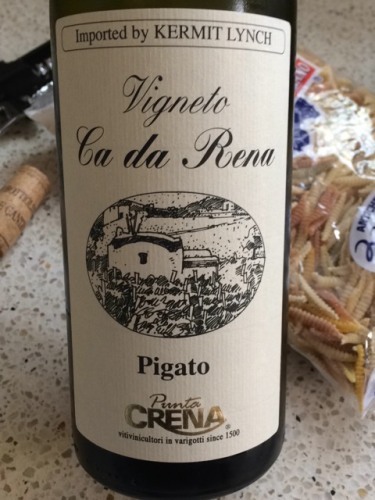 The Punta Crena Pigato is produced by the Ruffino family who has be farming this particular land for the past 500 years. And they tend their vineyards as they always have; terraced by hand, grapes picked by hand, nothing added, nothing taken away - let the grapes do what they will. No pretense here, just light, fresh wine that marries beautifully with the local cuisine of fresh vegetables, fritto misto, fish and of course, pesto alla Genovese! Genoese basil - 70 grams, preferably young and fresh. -Wash the basil in cold water and set aside to dry on a towel. -In the mortar, crush the cloves of garlic with a few grains of salt until the garlic has softened. Begin adding basil leaves (but don't add all at once!) The essential oils of basil are stored in the veins of the leaves. For the best taste, you must be careful not to tear or shear the leaves. Use a gentle circular motion, slowly crush the basil by moving the pestle around the edges of the mortar. The consorzio allows for a food processor, but it must be down quickly so that the heat does not oxidize the pesto. -When you notice a bright green liquid being drawn from the leaves, it is time to add the pine nuts. Once softened, add the cheeses, and finally the olive oil in a very thin stream. -Preparation should take place at room temperature and the sauce should be served immediately to avoid oxidation. So pour it over the pasta, possibly linguine or strozza preti, and enjoy!